As I was working on it, I wasn’t sure how this was going to turn out but in the end I really like it! Its pretty easy to do too. Pull out your diagonal score plate for your Simply Scored (or other score board) and place the paper in the upper left corner. 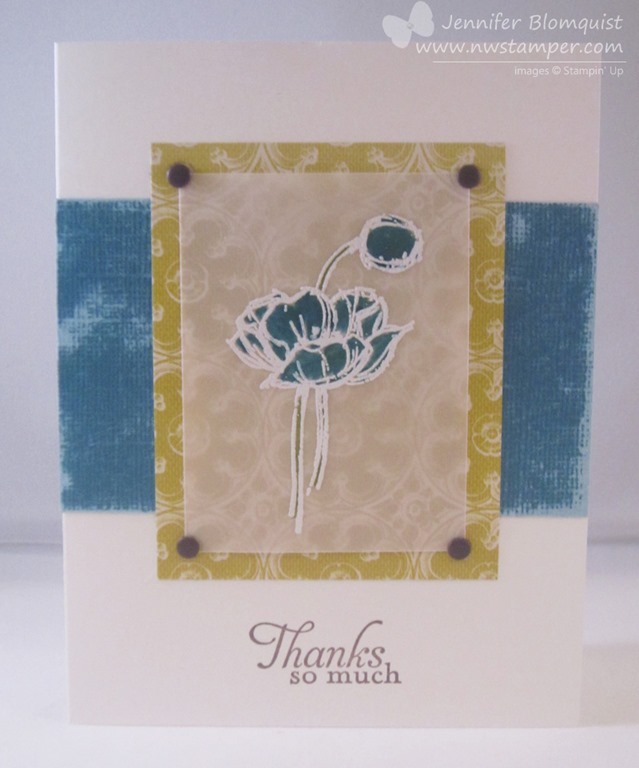 Embellish the rest of your card as desired and you are done! I plan to put together a video on this so for those of you who are more visual, check back or watch my YouTube channel for updates. Hopefully they will enjoy making this card at club on Thursday! If you are interested in learning more about the benefits of joining Stamp Club or would like to learn more about my NEW Virtual Stamp Club that will be starting soon, shoot me an email at jennifer@nwstamper.com and I’ll give you all the details! 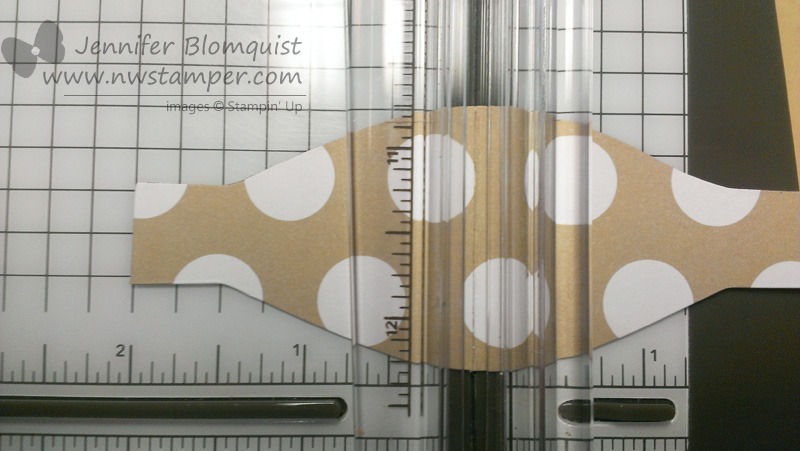 Spotlighting Paper Piercing for a Fab Blog Hop on Tools! 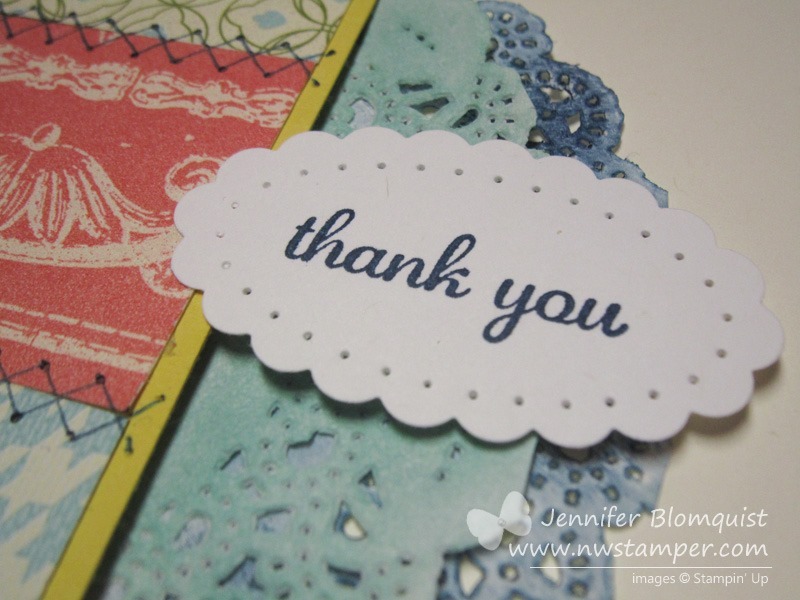 Thank you so much for joining us for the September Stylin’ Stampin’ Squad Blog Hop! 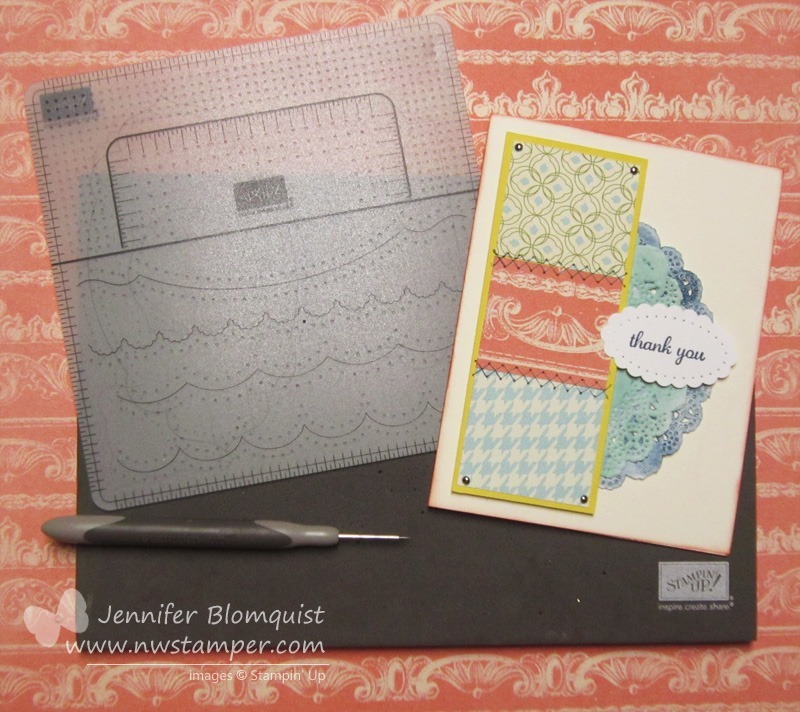 This month we are focusing on the tools of the stampin’ trade. Specifically, each of our favorite stamping tools. It’s amazing the kinds of tools that have been created to help us along in our paper-crafting addictions. 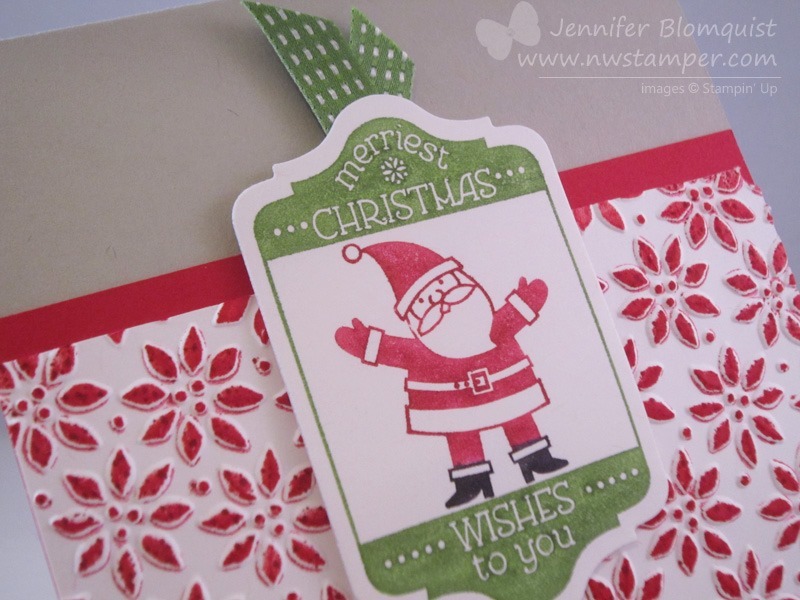 This month’s blog hop will showcase many of the Stampin’ Up! tools that are now available to us in the 2013-2014 Stampin’ Up! Idea Book and Holiday Catalog and even a couple of products that are so new they aren’t in either catalog. We hope you enjoy seeing how we use the old and new tools and are inspired to come up with some great projects of your own. 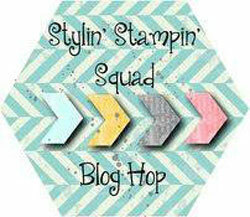 You should have just left stop number 9 on the Stylin’ Stampin’ Squad blog hop – Stuck on Stampin’. If so, you are in the right spot. If a link doesn’t work or you get off track, you will find the full blog hop lineup below. Ok, so are you ready to see what I picked for my favorite tool? I was going to pick punches (since, have you seen my wall of punches??) but that was well covered. 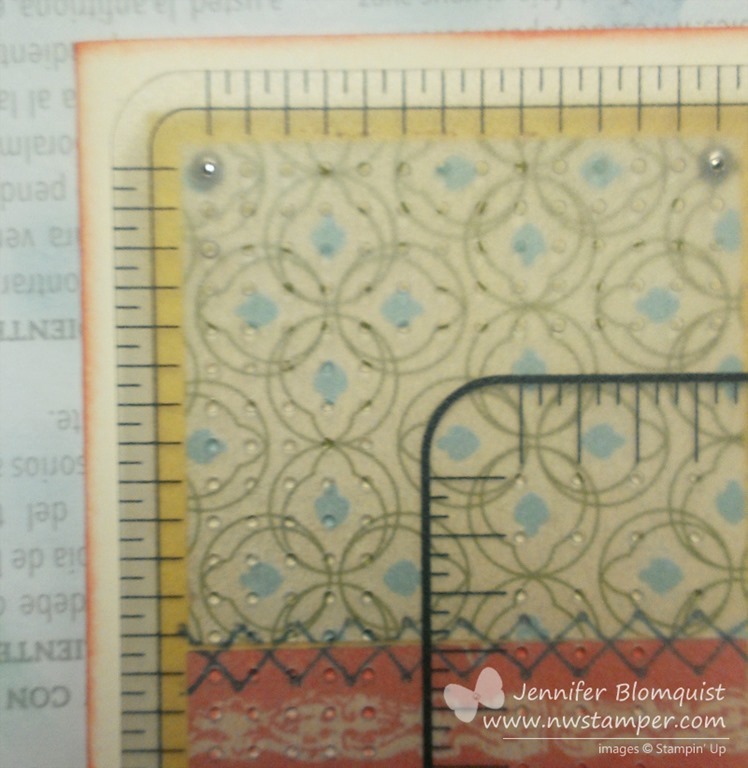 And so I decided to go with the less popular tool – the paper piercer and templates! I promise the picture above includes all three of the templates included in the Essentials pack, but its hard to see, so here is a better picture of all of the options available to you in the pack. 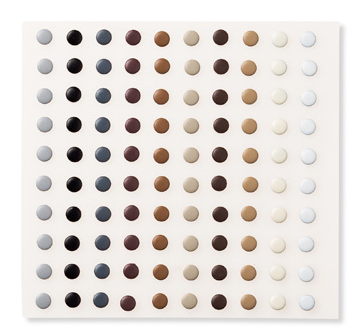 This is my absolute favorite pack because I cannot live without my straight rows of piercing holes. It is the simplest thing, but I use it all the time! Now, I love the shapes and patterns as well, and have found they give lots of possibilities even if you don’t own the coordinating punch or framelit. Can you spot all 3 uses of the piercing tool and template? Keep reading to see if you caught them all! One of the coolest techniques I know with this tool is the faux stitching technique and it is so easy to do as well. 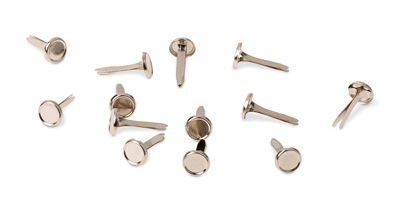 Yes, you can pierce your holes and then grab needle and thread and stitch on your cards…. or you can just do this. Line up the more widely spaced straight line holes of your paper piercing template so that the seam between two pieces of paper (in this case, patterns from the Etcetera designer paper) is exactly in the middle between the two lines of holes. Use your piercing tool to poke each hole and then draw your stitch lines in with your favorite color marker. Looks pretty real, huh? Since there are so many patterns on the templates, sometimes they are perfect to coordinate with a punch or framelit for an extra accent. 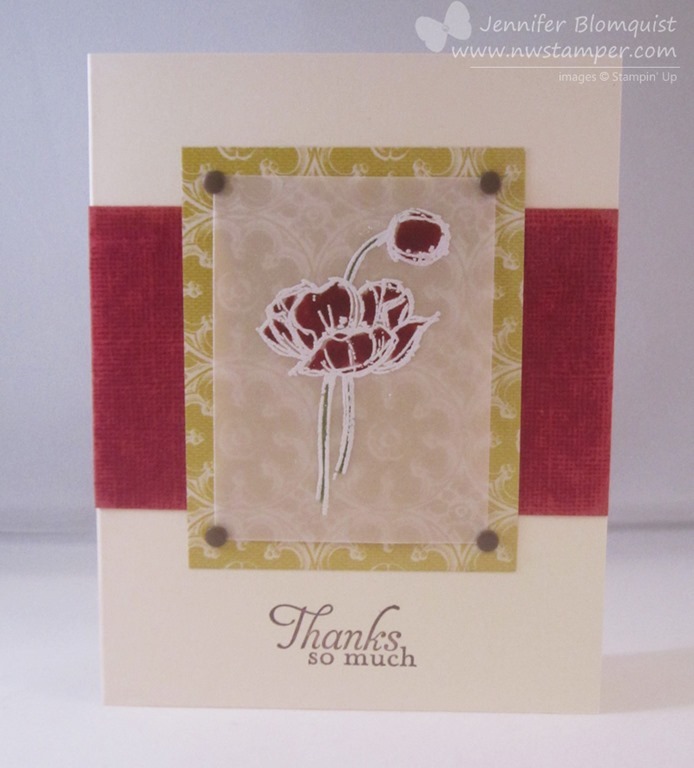 In this case, I loved how the oval of holes helps accent the sentiment in the center of the scallop oval punch out. You could do some faux stitching with this as well, but I thought the simple look was a bit nicer. You can also do this without needing to use a punch. Use any of the shapes to accent a stamped image on any project you are working on. Ok, this is my go-to use for my paper piercer and template – placing brads. 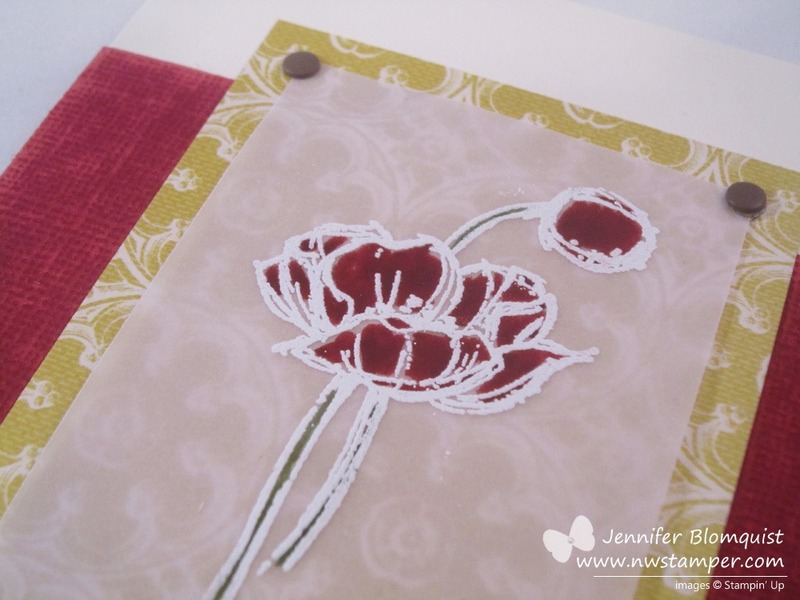 I am a pretty loosey-goosey card maker and stamper. I’m ok if my image is a little skewed (hey, its artistic that way!) and if I didn’t quite get that bow right. But one thing I can’t stand, is if an element that is supposed to be symetrical – like brads in a row or in the corners of a paper – comes out slightly off. So I ALWAYS pull out my piercing template when I’m going to add brads to a project so I can make sure they are spaced evenly apart and the same distance in from each corner. To do that, you just align the black solid line on the template along the edge of your paper and then pick the same hole in the corner to use for placement. Then just use the same corner of the template for each corner on your paper and you will get perfect corners every time! So, there you have it…. did you figure out all 3? I also wanted to take a quick moment to show one other little trick I did on this card…. yeah, it has nothing what so ever to do with piercing, but I thought it was cool. 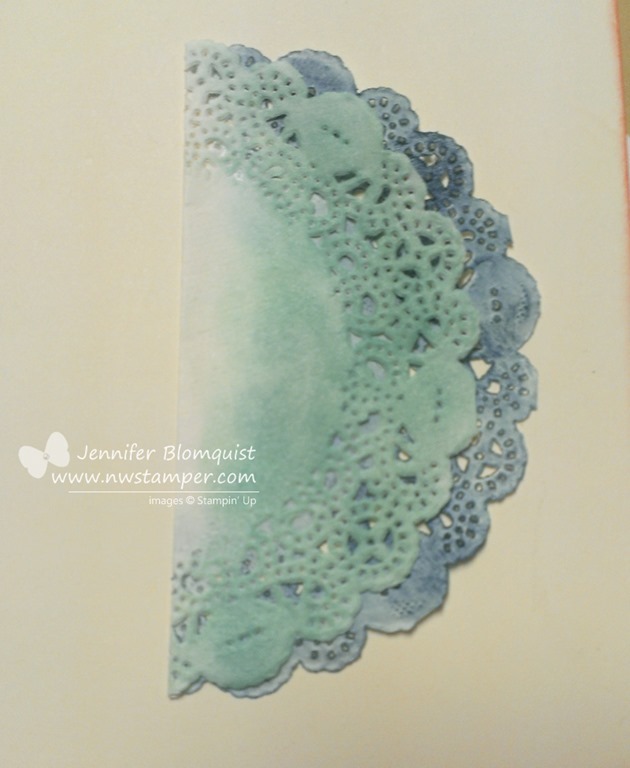 It was how I got the doily for the background of the card. I took a single doily and folded it in not-quite-half. Then I took a piece of scrap paper and placed it between the top and the bottom piece of the doily. I sponged the top piece in Pool Party; then I opened it up and sponged the bottom side with Midnight Muse. It gives a neat effect with no cutting and only one doily! I did a class on Paper Piercing a while back and so I thought I’d share a card we made in that class that gives you even more ideas for how you can user the piercing tool and template. So I hope you enjoyed all the tips and ideas, and now are inspired to get out your piercing templates and start creating! For even more inspiration and ideas for using the tools you have at home, keep on hoping and visit Bree for some fun with the Simply Scored! 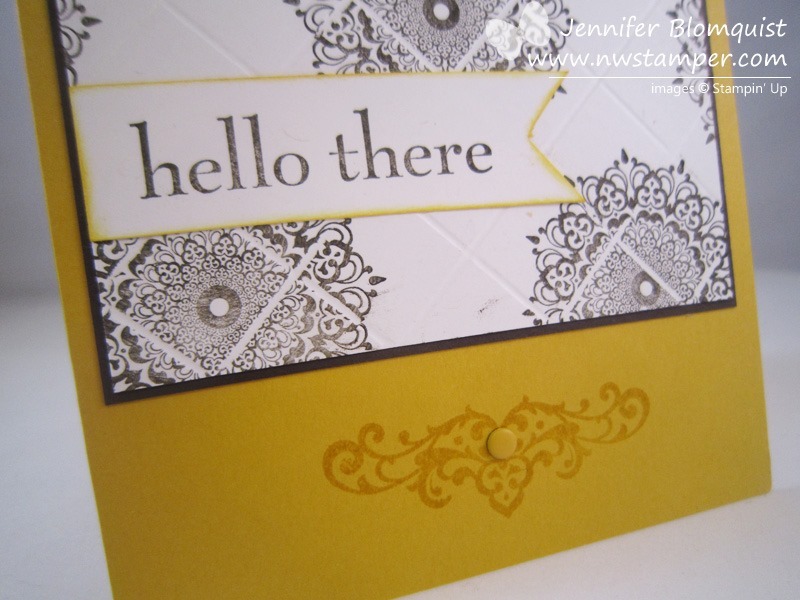 Jennifer B. of NW Stamper <— YOU ARE HERE! Help me better plan future classes, online offerings, tutorials, and events – take this quick survey on in-person and online class offerings and you’ll be entered to win! Take the survey now! When I was at convention this year, Shelli showed off some cards that had neat pop-up effects. 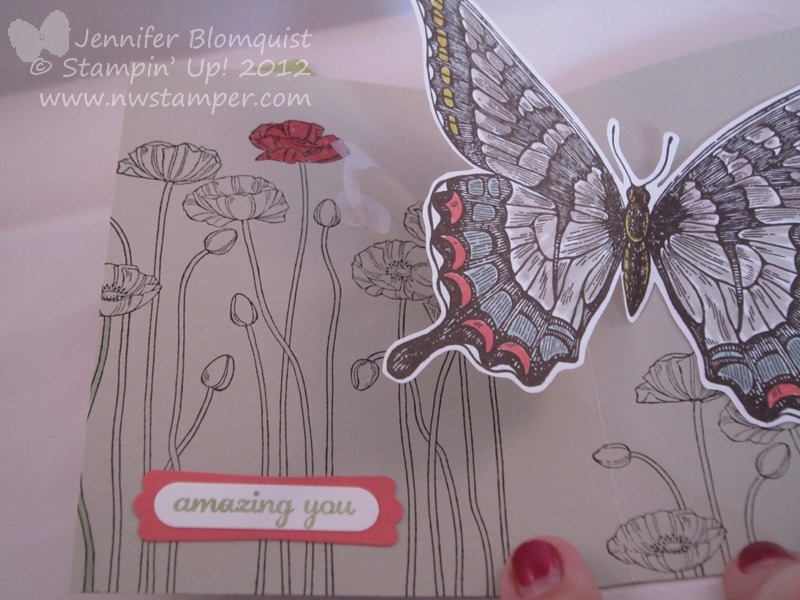 Once of the cards that really struck me was a cool card that used the Swallowtail butterfly to create a surprise pop-up on the inside of the card. I thought it was extra cool because when you look at that stamp image, it is too big to fit well on a card front and so I never would have thought it would have thought to try it on the inside of a card. So for a recent technique class, I decided to try it out and create that moment of surprise for class attendees as they got to make this card. 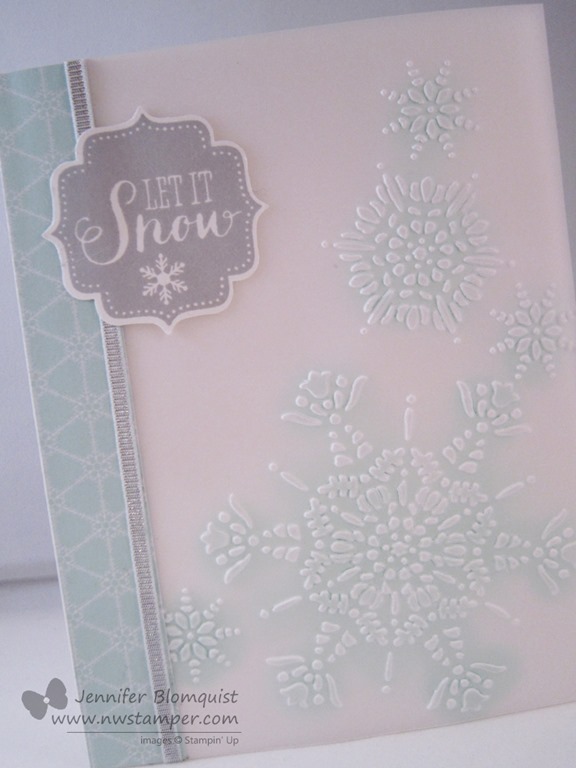 Here is the front of the card… I kept it simple since we were going to be focusing on the details inside the card. Then you untie the ribbon (which you need so the card doesn’t try to push open on you when you aren’t ready), open it up and hello, butterfly! If that is a little hard to see, here is another angle to help you see the pop-up effect. 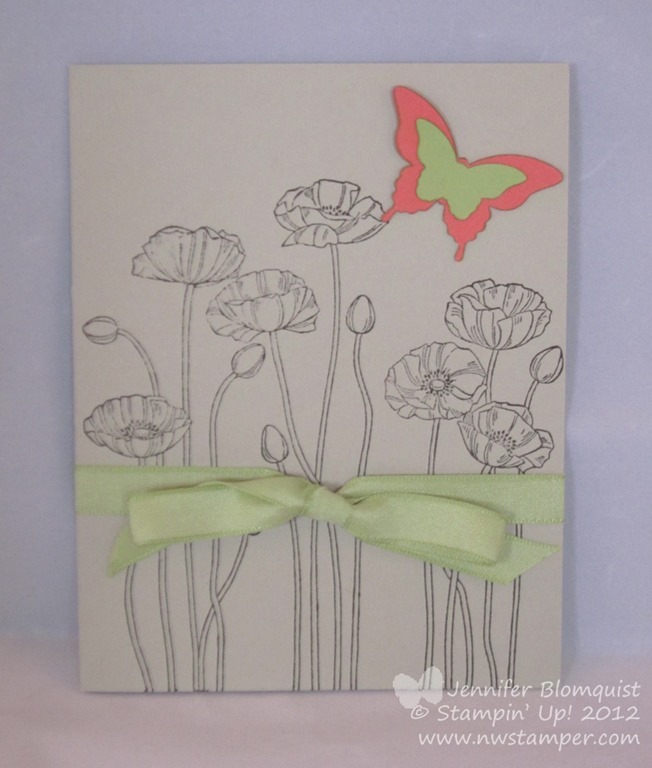 I also used the Pleasant Poppies background stamp to give the effect of the butterfly flitting through the flowers. 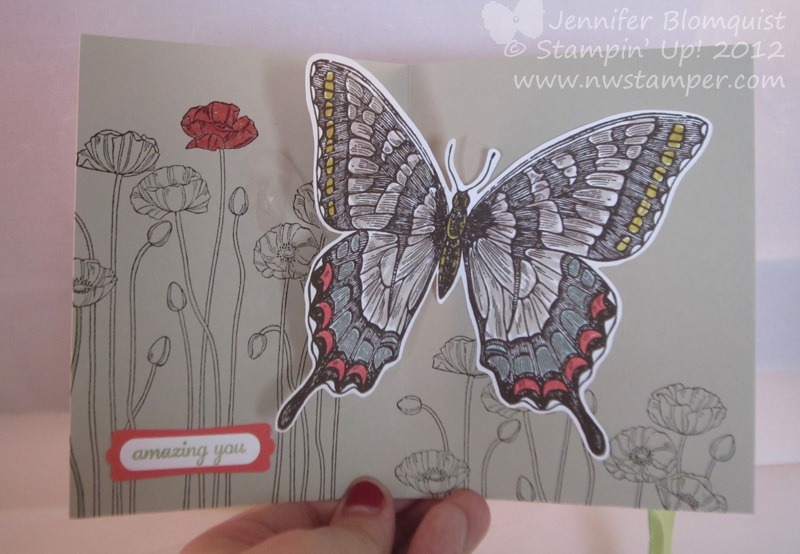 Start by stamping and coloring your Swallowtail butterfly image. Then cut out the butterfly. Gently fold the butterfly image in half (you don’t have to press hard to crease it, just make sure it is set to fold how you want when the card is closed. Take a piece of window sheet and punch a 1-1/4” circle out. 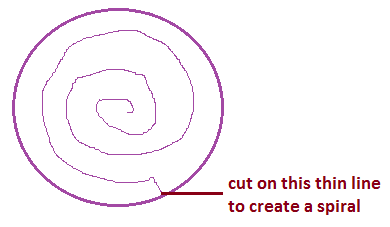 Cut a spiral into the 1-1/4” circle as shown in my poorly drawn image to the right. 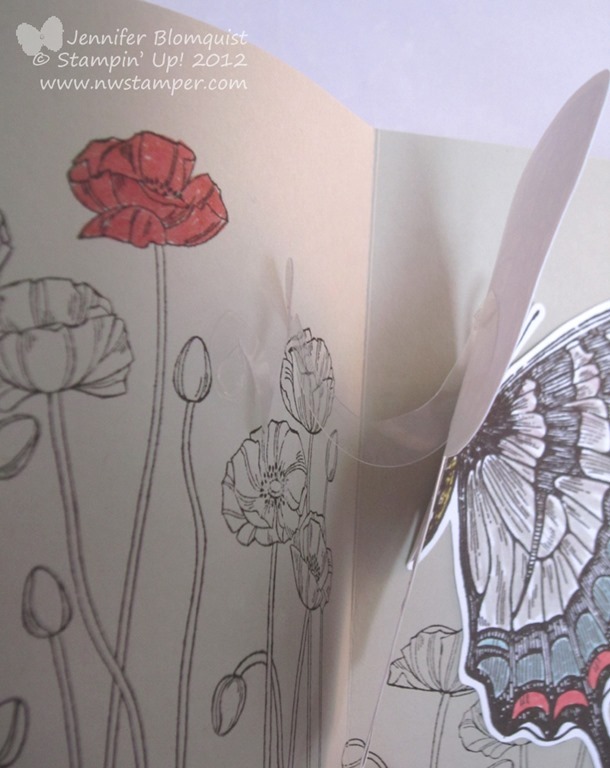 Glue the right wing of the butterfly to the right side of your card inside. Fold the butterfly in half and press the window sheet spiral onto the backside of the left wing with the glue dot in the center of the spiral sticking to the wing. Hold the butterfly down so it is folded in half and close the card. This will allow the left side of the card inside to stick to the glue dot on the edge of the spiral. Open the card and check if you like how much of a pop you get with your butterfly. Reposition the spiral as needed to get it just how you like. Hopefully that made sense! If not, let me know and I’ll try to put together a video on how to do the pop-up effect. 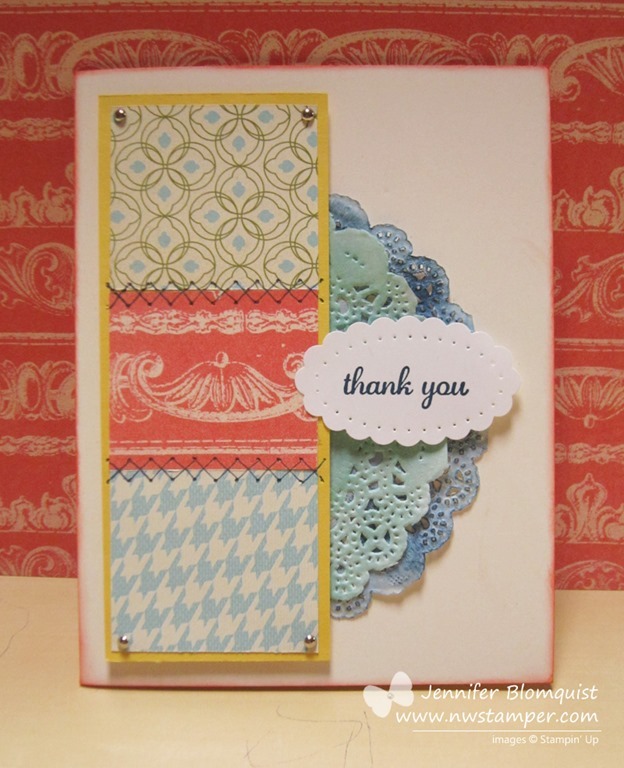 Like I mentioned, this is a card I shared at a recent card class and I loved the idea of sharing some pop-up and flip style cards with everyone. I’ve finished my class schedule for the rest of the year – so if you are interested in joining me at a future event, check out the calendar and let me know! 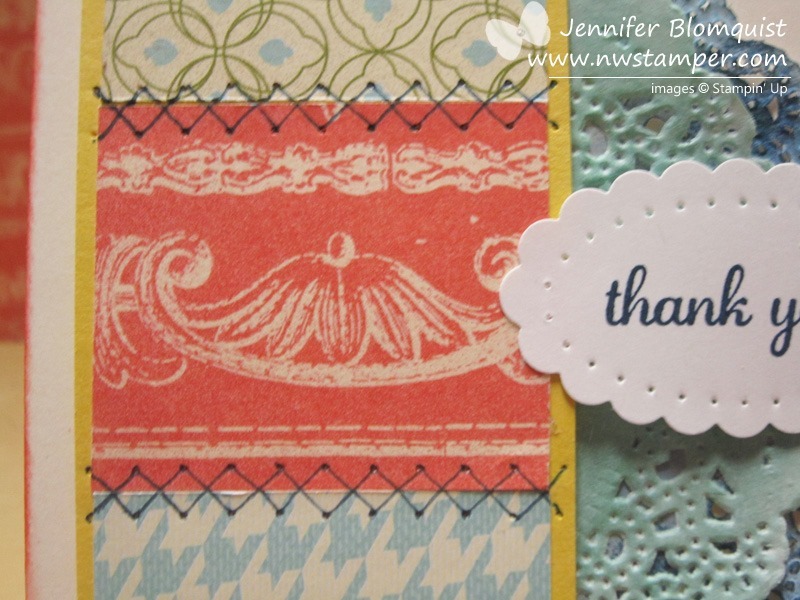 Want to win a $20 Stampin’ Up! shopping spree? Take this quick survey on in-person and online class offerings to help me better plan future classes, online offerings, tutorials, and events and you’ll be entered to win! In the meantime, give a pop-up card a try! They are fun and easy, and give the recipient a fun surprise. I know me, and once I let life overwhelm me and I set my crafting aside because I’m busy trying to deal with the house, family, etc; I find myself getting into a crafting slump. You know, that time when you look at your craft supplies, get so excited to create something cute (or find yourself needing that last minute birthday card) and you sit down at your table….. and just stare at your supplies. That was me. I saw so many great ideas at convention, had some cool topics for blog posts, but was having the hardest time finding the mojo to get started. But – that is why I said YES! 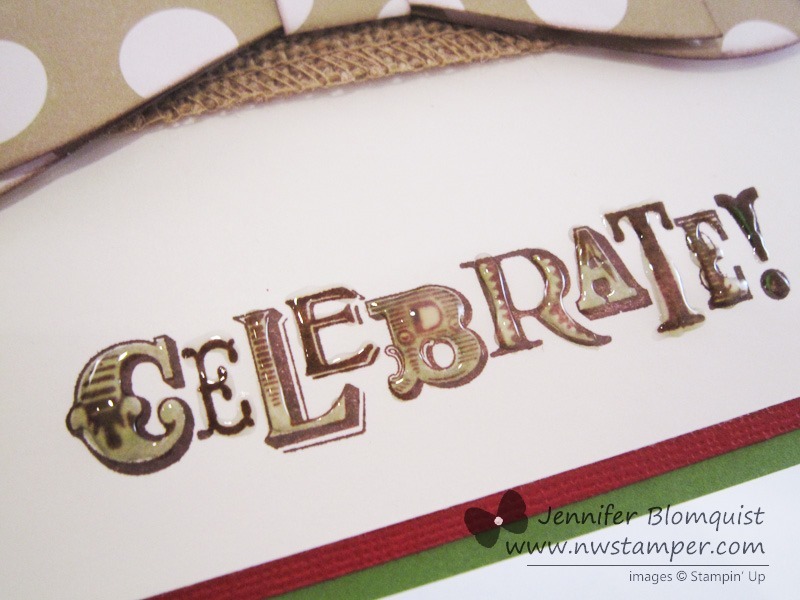 when I was invited to join the Stylin’ Stampin’ Squad and their monthly blog hops. Because I know me and to get me out of my slump, I needed a theme to focus on and a deadline that I had to get it done by. And it worked for me! I sat down with a few ideas, started pulling out some paper and by the time I was done with my first card I had ideas for a few more and couldn’t wait to have time to play more! When I first checked out the Holiday Catalog, I wasn’t too excited by the Build-a-Banner kits. But then I saw all the fun projects created with them at convention and I had a major change of heart. I love the banners and can’t wait to make my first one, but I was even MORE excited by the stencils! I know, I know, there isn’t anything new about stencils, but –hey- they are new to me! And for my first attempt with them, I figured why not try to do some heat embossing while I’m at it? I don’t own any current halloween stamps but I loved the fact that I could still do spooky without even needing a stamp at all! 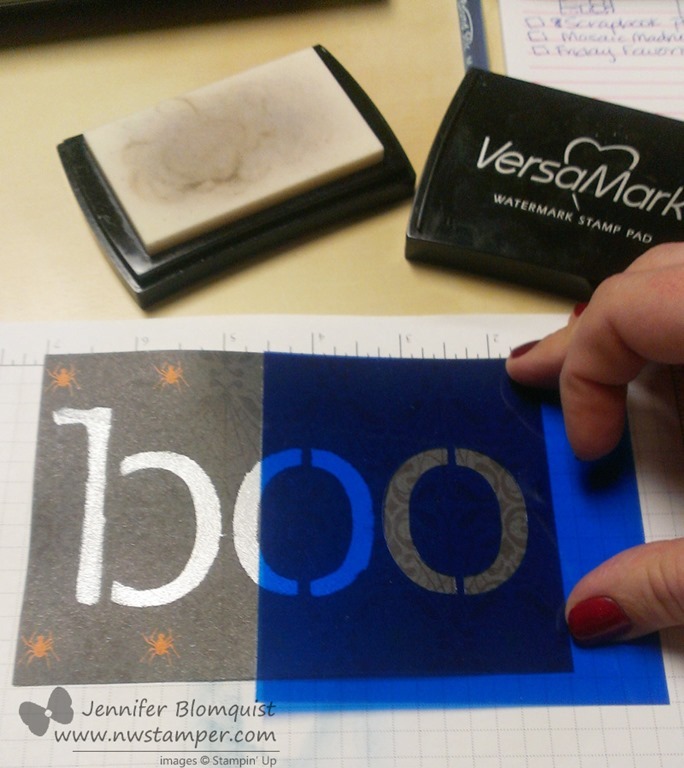 So to make the “boo” on my cardfront, I tapped and smeared VersaMark ink over the stenciled opening (starting with the “b”) and quickly picked up the stencil, sprinkled white embossing powder, and heated with my heat gun. Then repeat for each letter as you go through the word. The rest of the card came together quickly as well because I used the new Witches Brew designer paper which had those cool orange spiders in the perfect spacing for me. 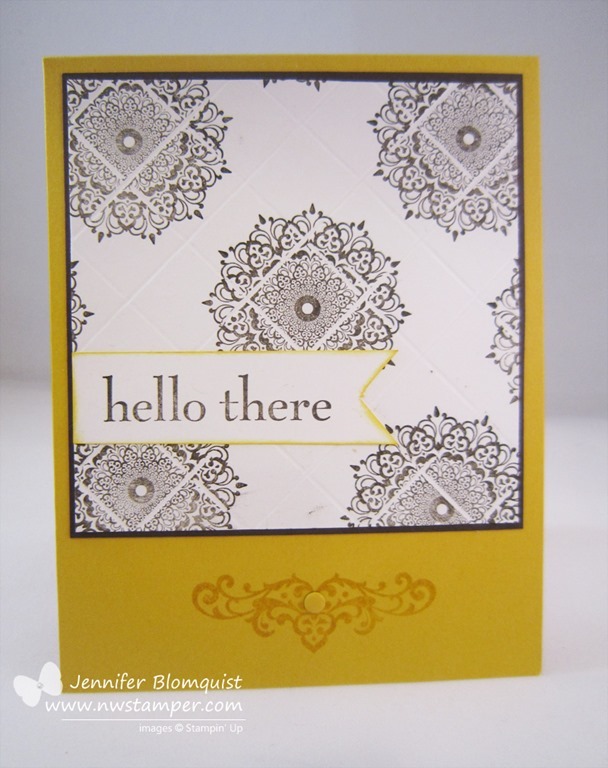 Sponge the edge with some White craft ink and layer over a Basic Gray cardbase and you are done! 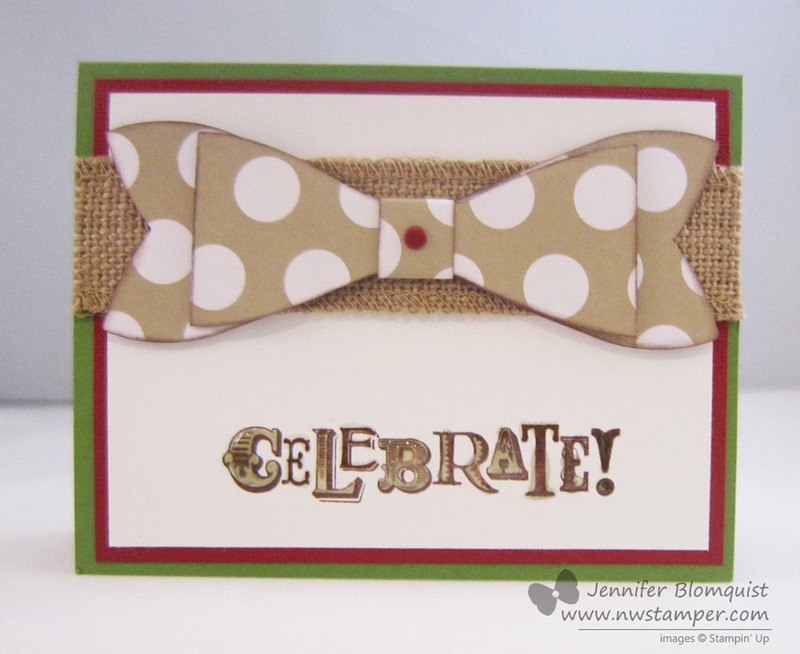 Card 2 – Bow Tie Celebration! But one card just wasn’t enough for me. I told you, when I was done I had more ideas I wanted to play with. Well, this next card was using the new Gift Bow Bigz Die. I had seen a card by Ronda Wade that had a more flat looking bow and I wanted to try to create one myself. Ta-da! 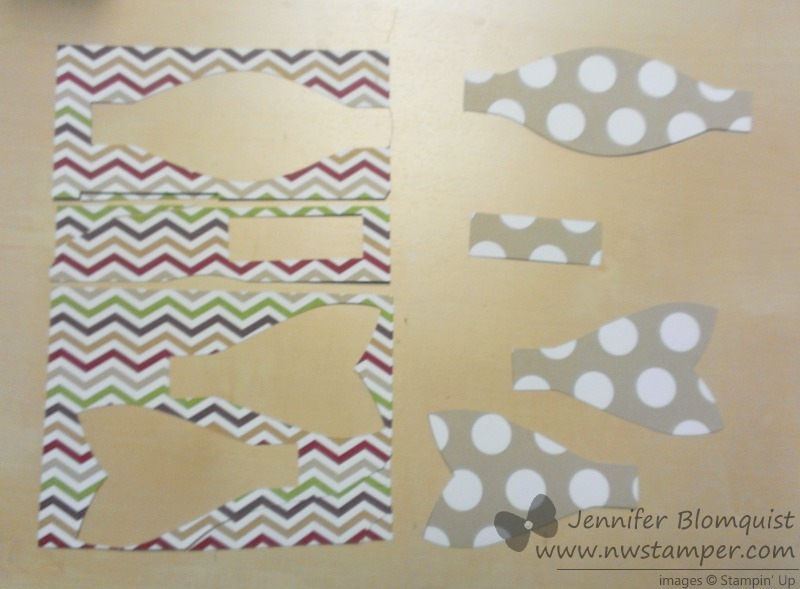 Then all you have to do is cut that top die cut shape in half to make your two flat bow “loops”. I found that if you lined up a flat edge at 2” you will cut straight down the middle too. I glued my bow together with sticky strip and Stampin’ Dimensionals and adhered it over some of the new Burlap Ribbon. 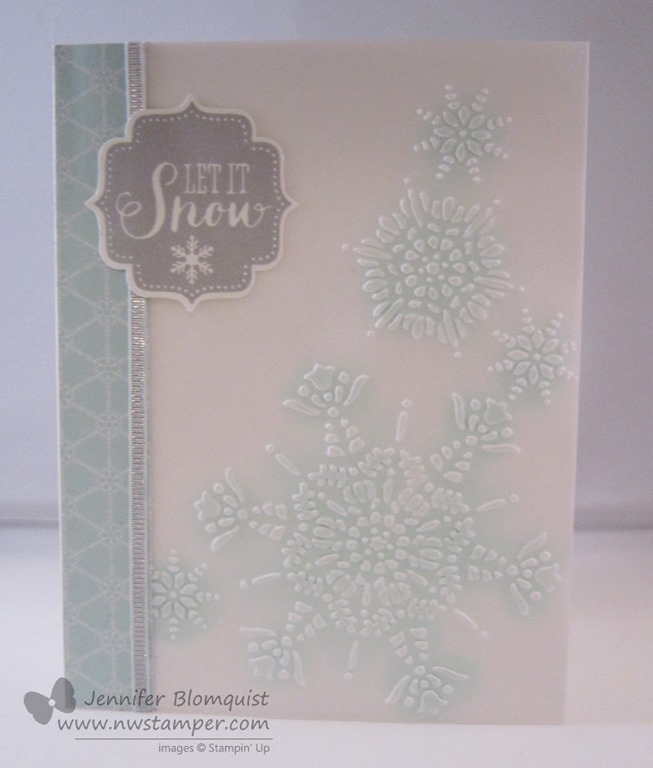 Finally, I stamped my sentiment from Seasonal Sayings but thought it needed some extra pop so I coated it with Crystal Effects. Makes it feel more like a celebration to me. And with that, I even created one more card for tomorrow’s blog post and I’m back in the groove! So if you are in a mojo slump, here is my challenge to you! Pick an item you were excited to purchase, but haven’t even used it yet! Create something, anything, even if you have no idea what to make, start cutting and stamping using the item you picked. Copy a project you’ve seen on the hop or visit one of the many great challenge blogs and inspiration blogs out there to help get you started if you need it. Finish and share your project by 8/16! Show it to a friend, post it on Facebook, or come back and leave a comment that you’ve completed the challenge and share it with me! Feel free to link to your project too so we can see what creative project you’ve created. Check out all of the great talent in this month’s line up! Enjoy and have fun creating!